The world-famous superyacht hotspot, the Monte Carlo Harbour in Monaco. Clyde & Co provide expert legal advice to those buying and selling luxury yachts. Picture courtesy of Shutterstock.com / Bahdanovich Alena. John Leonida, partner at the superyacht law firm Clyde & Co, has already shared his tips on buying a superyacht and in this interview, he gives his expert advice to those looking to sell one. Having advised on more than $4 billion worth of superyacht transactions since 2005, he is well-versed in the world of luxury yacht sales, while Clyde & Co has been guiding superyacht owners for more than 30 years. When it comes to selling superyachts, it seems that you can judge a book by its cover, as buyers' checklists for the perfect yacht are longer than ever before. "The first thing you should look at when selling a superyacht is what she looks like quayside," says Leonida. "Does she have the kind of kerb appeal that any superyacht has that makes her attractive to be sold?" Deciding on whose advice to follow is as important as the advice itself. "They [his clients] often ask me ‘how much do you think I can get for this superyacht?’ The best person to advise you on a price are the people who are selling yachts all the time and that’s the yacht brokerage community," says Leonida. "Don’t just take the word of a single yacht broker unless he’s your yacht broker that you trust." Additionally, time and care should be given to selecting an asking price for your vessel, as it has to be both accurate and reflective of the current market. For example, this summer, buyers are approaching the market with more caution than in previous years. "If you’re choosing between different yacht brokers, don’t necessarily choose the highest price, choose what you believe to be the right price, the realistic price for your yacht," says Leonida. "Try and ask about the achieved prices for yachts similar to yours that have been sold in recent weeks or months and then choose a price." 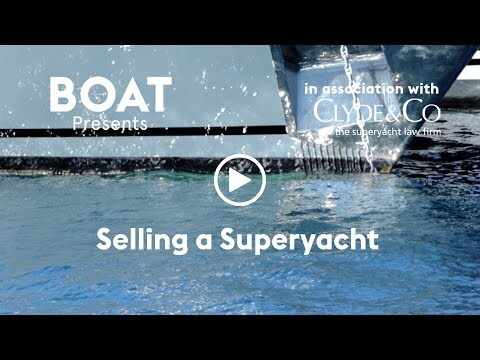 Finally, Leonida explains some common pitfalls of those selling superyachts. "In my experience, the most common mistakes that sellers make is a lack of transparency," he says. "If you are open and transparent, seemingly gigantic problems if they are not disclosed become small problems if they are disclosed because the buyer has full sight of them." Clyde & Co's expansive team of partners, consultants, advisors and associates can cover all areas of the superyacht industry beyond buying and selling, such as finance, insurance, design and build.